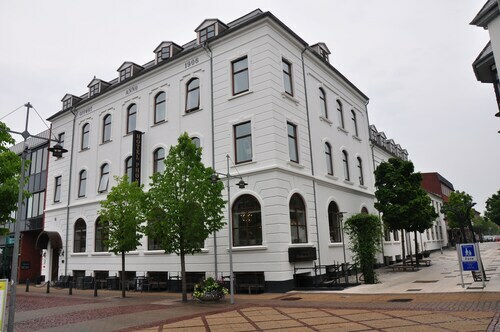 Located in the heart of Bronderslev, this hotel is within 16 mi (25 km) of Borglum Abbey, Faarup Sommerland, and Lokken Beach. Brønderslev Station is only a 3-minute walk. Pet owners shouldn't miss Bronderslev, a city known for its golf courses, and sights like Lindholm Hoje and Aalborg Marine Museum. Enjoy top attractions like Borglum Abbey, Faarup Sommerland, and Lokken Beach. Other things to see include Blokhus Golf Club, Blokhus Beach, and Vendsyssel Art Museum. Need a pet store? Try Triops.dk and Nordic Breed. For vet care, Sulsted Dyreklinik, Brunder Animal Hospital A / S, and Midtvendsyssel Dyrlæger I/S are located in the area. Pets are allowed for a fee at this 2.5-star hotel, although restrictions apply. Weather can make a huge difference, especially if you want to spend time outdoors. Here are the average daytime and nighttime temperatures to help plan your trip in Bronderslev. From January to March, average temperatures range from 45°F in the daytime to 27°F at night. Between April and June, the daytime average is 69°F and the nighttime average is 33°F. From July to September, average temperatures range from 71°F in the daytime to 45°F at night. Between October and December, the daytime average is 57°F and the nighttime average is 30°F.